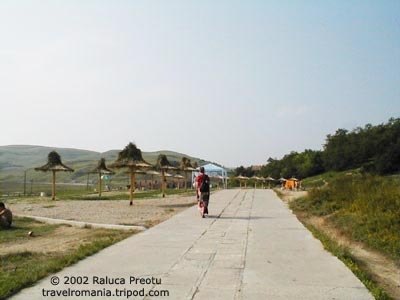 If your summer itinerary includes Cluj-Napoca, you might want to detour 22 km to get to the seasonal resort in Cojocna. 1. You won't be able to swim, but the fun of staying afloat in any position will probably make up for that one disadvantage. 2. Try not to dive: this is a no-splash environment. 3. Bring suntan (you might not be able to shop for any in the lakes area), and remember that salt brings wonderful health benefits. 5. Admission cost is minimal: less than a dollar. It was 25,000 Lei when I visited on August 4, 2002. Parking your car inside cost 20,000 Lei, but there was also plenty of room outside the resort area. 6. You can certainly drive to Cojocna, but you may try the more picturesque route. I took a train from Cluj at 7:40 am, and walked 6 kilometers from the train station (30 minutes from Cluj) to the resort area. All those nature sounds and village life made for a memorable experience. 7. Food. I'd say bring your own. What they sell is more on the snacks, ice cream and soda side. Thanks for being here! If you'd like to stay posted of new pictures and news, send me an email with "subscribe" in the subject line. Photos from Bucuresti, Banat, Dobrogea, Maramures, Moldavia, Transylvania and Wallachia. On the Elizik Romania pages developed by Liz Mellish and Nick Green, dance teachers and researchers of Romanian dance, music, costume and folklore. Added: October 4, 2005. Updated: January 25, 2010. This engaging 2:30-minute video takes you to Sighisoara, Peles and Bran Castles, the Danube Delta, the Black Sea resorts, and the painted monasteries of Southern Bukovina (northeastern Romania). From WatchMojo.com. Added: January 25, 2010. A 45-second presentation clip from Ogilvy & Mather Romania. Added: February 14, 2006. Center for Romanian Studies, 2000.